" We collected four cubic meters of waste and transport it using motor waste cart"
Communal work was done to anticipate dengue fever by cleaning the are from grass, weeds, plastic waste, and household waste that clog the ditches and channels. 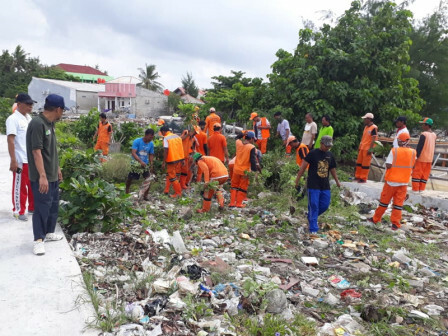 "We collected four cubic meters of waste and transport it using motor waste cart," said Murta'a, Harapan Island Urban Village Head, Saturday (2/9). He coordinated with Environment Sub-department unit to help transporting waste from pier's temporary waste disposal site (TPS). "We also asked them to transport it immediately using KM Laut Bersih ship," he con veyed.